This entry was posted in Training & education on 2017/09/20 by Susan. As Nanaimo’s newest fire chief – and its first-ever female fire chief – Karen Fry says the key to safety is dealing with issues as soon as they arise. Karen Fry is the City of Nanaimo’s newest fire chief. She says it’s important for management to show staff that their health and safety is important. When you hear about a firefighter getting injured, you probably picture it happening at the scene of an emergency. But in reality, about one-third of all firefighter injuries happen in fire halls. I wrote about this in my post Injuries happen when you least expect them. As she settles into her new role, Karen says she and her team will continue to work on their health and wellness program. She says it’s a broad program that includes mental health strategies, critical incident stress management, focusing on fitness and nutrition, and much more. You can read more about her work to promote firefighters in the community and to educate people about fire detectors and other safety issues in this Nanaimo News Now story. 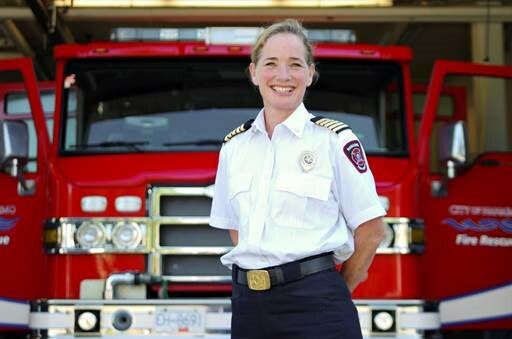 As Nanaimo’s first female fire chief, Karen encourages women to see firefighting as a viable career. She supports Camp Ignite, a four-day camp that introduces teenage girls to the world of firefighting. Karen adds that young women often doubt they have enough physical strength for firefighting. “The first thing most girls think is that they have to be physically stronger than they are now. But, in general, we’re a lot fitter than we used to be 30 years ago – and longer into our careers, too,” Karen says. Thanks to Karen for talking with me and also for encouraging young women to believe in themselves.